Photo courtesy of Andy Rusch. Some Rights Reserved. Waiting in San Jose for your flight or tour connections? Well, if you have a few hours to spare, don’t despair. Choose a museum from the guide below to learn more about Costa Rica, and have fun doing so! Gold Museum: Located underneath the Plaza de la Cultura (Culture Square) in the center of bustling San Jose, this museum protects a large collection of Pre-Columbian gold artifacts. The mostly tiny ornaments were worn by indigenous people in the centuries before Columbus arrived in Costa Rica; namely between 500 BC to 1500 AD, and represent the culture and beliefs of these ancient tribes. The pieces are mainly figural with both animal and human features — symbolizing the idea that humans were attributed with animal characteristics. The religion, akin to that of native Americans, was very much in harmony with their natural surroundings. The museum also houses exhibits which show the history of the country’s currency, the Colon, and other regular, rotating art shows. Opening hours: 9:15am – 5:00pm Monday through Sunday. Price: $11 for adults and children. Jade Museum: Since 2014, this small museum has been situated across from the Plaza de la Democracia (Democracy Square) and not in the INS building as many websites and guidebooks still incorrectly state. The name of the museum is a little misleading since there are also ancient pottery, bone and other Pre-Columbian artifacts, in addition to the namesake jade exhibits. The newly constructed, five-floor interior boasts bilingual, interactive screens and activities to help the story of this country come alive. This museum appeals to the twenty-first century visitor through the use of such technology as holograms — depicting the daily life long ago. Opening hours: 8:30am – 3:30pm Monday through Friday; 8:30am – 2:30pm on Saturdays. Price: $15 for adults and children. 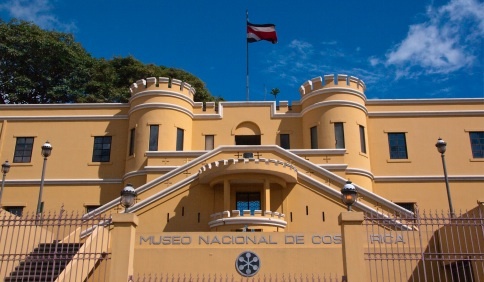 National Museum: This museum is located within the walls of the Bellavista Fortress, with its bullet-scarred walls, a testament to its role in the country’s brief civil war. Overlooking the Plaza de la Democracia, the building and square are symbols of Costa Rica’s decision to be a nation of peace. The museum has a delightful butterfly room, where visitors can view the full spectrum of native butterflies that may be found throughout the country. Other highlights include a gold room, some of the mysterious stone spheres from the Osa Peninsula and preserved rooms where time stands still to show the building’s past as an army barracks. Opening hours: 8:30am – 4:30pm Monday through Saturday; 9:00am – 4:30pm on Sundays. Price: $8 for adults and children. Children’s Museum: Housed in an old prison, this museum is surprisingly welcoming and, from the outside, resembles a fairy tale castle rather than a jail. Inside, a few cells have been preserved as a grim reminder of the building’s past, but otherwise, the interior is kid-friendly and a lot of fun. High points are the earthquake simulator where kids stand to experience how tremors feel, interactive games with body parts, and the “Walk through History” rooms. During school vacations, there are numerous arranged activities in addition to the normal displays. Opening hours: 8:00am – 4:30pm Tuesday through Friday; 9:30am – 5:00pm on Saturdays. Closed Mondays. Please note that this museum will be open on Mondays during school vacations. Price: $4 for children, $5 for those 15 years and older.